Today is the birthday, according to some sources, of Jane Barnell, known professionally as Lady Olga Roderick. (Two different birth dates are given for her, depending on the source: January 3, 1871 or February 28, 1877. All sources agree that she died in 1951). 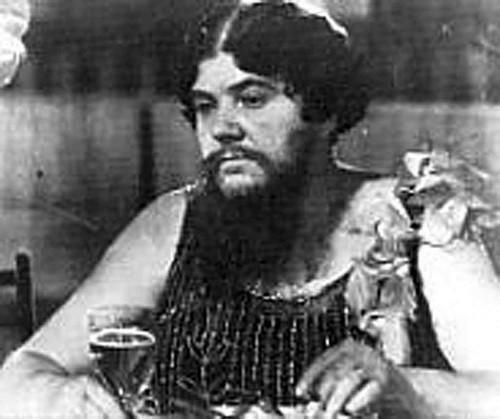 Olga is best known to posterity for her role as the bearded lady in Tod Browning’s movie Freaks (1932). This is interesting to me. Unlike many of the performers in that storied film, Olga was possessed of a condition that could be easily gaffed, just a matter of some whiskers and spirit gum. That he cast an authentic sideshow bearded lady I think says something about Browning’s aims in that film. It is not just a movie about a freak show. It is the freak show itself. Like most of the stars of Freaks, Olga had an amazing life. Originally from Wilmington, North Carolina, her parentage was half Russian Jewish, and half Catawba Indian. Olga was hirsute since infancy, prompting her mother to sell her to a circus at age four while her father was away on a business trip. She fell ill while on tour in Germany with the Great Orient Family Circus. They dumped her in an orphanage and her father came and retrieved her. As an adult she was lured back to the sawdust by the John Robinson Circus in the 1890s, and she subsequently worked for a couple of dozen others over her professional career, including Ringling Brothers, Barnum and Bailey; Forepaugh-Sells; the Dreamland Circus Sideshow in Coney Island; and Hubert’s Museum in Times Square. At one point her beard was advertised as thirteen inches long, “the longest in the world”.